About a month ago, I was at work one evening, trying to ignore a pretty bad headache. In the midst of my work, I suddenly was overcome with nausea, making my headache worse and causing me to wonder if I'd even be able to drive home. Needless to say, I went home early that night, and put myself right to bed. I thought over all the possible causes of this sudden illness, which thankfully passed by the morning. I pinpointed several likely culprits, allergies and my diet being the two main ones. Scranton is one of the worst areas in the country for spring allergies. Other than get an air purifier for my office (which I quickly acquired), there wasn't a lot I could do regarding my allergies. I try to avoid over-the-counter meds whenever possible, so I focused my energy on the second area I identified as likely to have caused the illness: my diet. 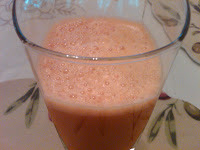 Juicer: I decided to buy a juicer, in hopes that I could drink fresh fruit and veggie juice in the mornings as an energizing alternative to coffee. Although the clean-up is a little cumbersome, I am trying to juice at least 3 times per week. I have had my juicer for several weeks now, and I love it. 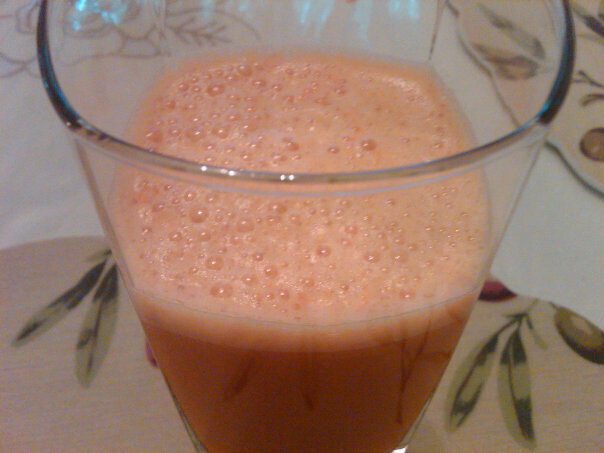 So far, my favorite juice has been carrot-apple-ginger (pictured right). Wow, talk about satisfying! Whole Grains: After seeing the name of a certain cookbook turn up over and over again, in trusted sources, as I sought ways to improve my diet, I finally decided to obtain the book Nourishing Traditions. This book makes the very good case for returning to a diet modeled after traditional communities and cultures, all of whom tend to enjoy great health. One characteristic of this sort of diet is to eat whole grains, which you want to soak before cooking. Soaking them in warm water plus a bit of a fermenting agent (such as whey, vinegar or lemon juice) causes the grains to actually begin to break down, making digestion easier and also enacting all sorts of proteins that are good for you. This weekend I soaked and covered with a dish towel 1 cup of quinoa for just under 24 hours in 2 cups of warm water and 2 tablespoons of lemon juice. 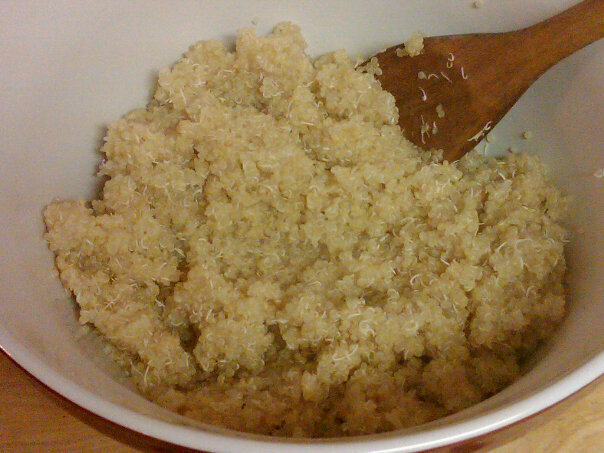 At the end of soaking, I drained the grains, and then cooked them in 1 cup of water for 10-15 minutes like I would cook rice (pictured above-left). And they came out great! I plan to do more of this moving forward. There are other little things I've been doing as well, including cleaning out my fridge and pantry of things that were either expired or clearly not very good for me. All of this is because I want to feel better. It's that simple. And, so far, it seems to be working. For me, it's a bit of an adventure though, since I have never been discriminating about what I ate until now. And it's going to be a slow process... There's no way I can go cold turkey on certain things that have been staples in my diet until now (ex. things made with white flour). I do plan to slowly cut down on unhealthy things though, and certainly being in the midst of the Apostles Fast is helping. So, we'll see where this all leads for me -- God willing, to better health! Bravo, Donna! Keep up the good work! Have you tried White Wheat Flour, distributed by King Arthur Flour? Soak it just as you would any whole grain (it is a whole grain, just ground up), and it will be hard to distinguish from all-purpose flour. This is a whole wheat flour, made from soft winter wheat instead of the usual red wheat. I've heard you mention Nourishing Traditions before on Facebook. I'll have to give it a read. Instead of buying a juicer when I had a mini-health crisis a couple of years ago, I bought a Vita-Mix blender. I'm trying to do green smoothies for breakfast now, my usual recipe is 1/2 a frozen banana, 1 cup frozen blue/black/raspberries, 1/2 cup of yogurt, 1 cup of kale, and a tablespoon of flax seeds. Pretty yummy and you don't even notice the kale.